When you define the real purpose of a project, things get clearer. Your mind starts buzzing with ideas. Knowing where you want to end up is especially important at this stage. Your vision for the most successful outcome helps you establish guidelines for keeping yourself and your team on the right path. It’s important to remember that stakeholders aren’t only the people who hired you to manage the project; a stakeholder is anyone who’s affected by the results of your project. That includes your customers and end users, too. Make sure you identify all stakeholders and keep their interests in mind when you create your project plan. Meet with the project sponsors and key stakeholders to discuss their needs and expectations, and establish baselines for project scope, budget, and timeline. Then create a Scope Statement document to finalize and record the details of the project scope, get everyone on the same page, and reduce the chances of costly miscommunications. Once you have a list of stakeholder needs, prioritize them and set specific project goals. These should outline the objectives of the project — the benefits you hope to accomplish. Write out your goals in your project plan so it’s clearly communicated and easily shared. How can you know if your project is going to be successful if you don’t have any way of measuring success? You will need interim milestones, especially for an endeavor that will span a long time, so that you can determine if you are staying on track or straying from the project’s goals. You must have both internal checkpoints and client checkpoints. Never leave incorporating a client’s feedback until the very end of the project! Identify crucial moments throughout the project. You can provide a life cycle of the project by including the four main phases: initiation, planning, execution and closure. Perform a real evaluation at the end of each phase. Make sure to examine every deliverable. From parts of the product to the technical documents to the project plan, you will need all of the elements involved to ensure the product is meeting the project specifications. Gather your team members, and make sure that skill-sets align with required roles. This is an important first step: If you assign the wrong person to a task, you are reducing your chances of success before the project even begins. Make sure each team member is clear on what is expected from them and when. Clear and open communication is mission-critical. 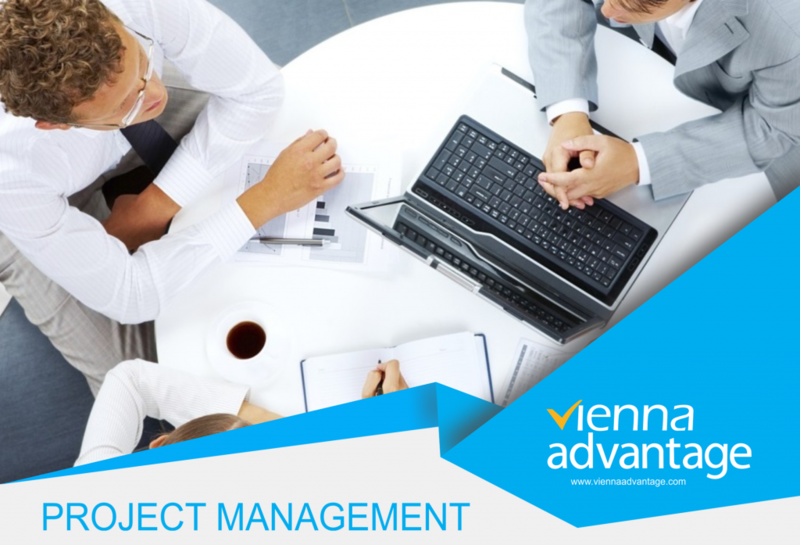 When searching for the right project management software solution for your company do not forget to add the VIENNA Advantage solution. Our Project Management Module can be easily integrated with our ERP and CRM solutions, and it can be extended to your specific needs. Look at each deliverable and define the series of tasks that need to be completed in order to accomplish each one. For each task, determine the amount of time it will take, the resources necessary, and who will be responsible for its completion. Next, identify any dependencies. Do certain tasks need to be completed before others can begin? Involve your team in some of the planning process. The people doing the work have important insight into how tasks get done, how long they’ll take, and who’s the best person to tackle specific tasks. No project is risk-free! You should carefully examine all issues that you know of upfront that will affect your project. Consider the steps you could take to either prevent certain risks from happening, or limit their negative impact. Conduct a risk assessment and develop a risk management strategy to make sure you’re prepared.